This workshop will introduce VRay as a tool for rendering. 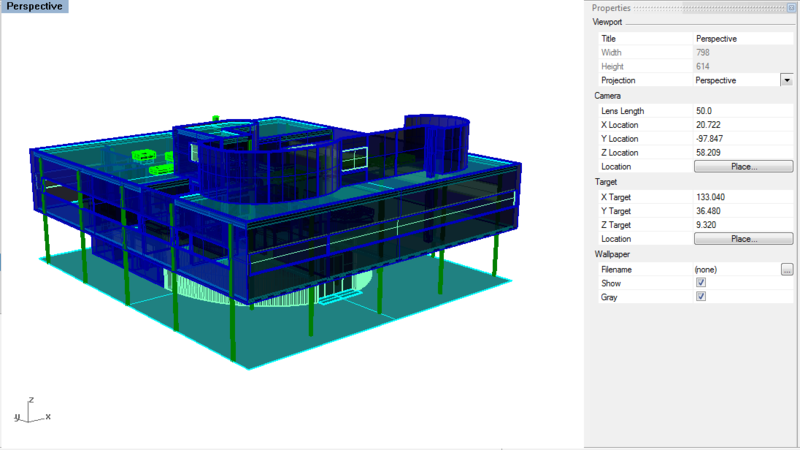 The underpinnings of this rendering software, including settings and material selection/creation will enable you to create specific and variable images of your Rhino3d models. The goals here will not be to create "finished products" directly from VRay, but rather to help you generate a "base" image that will be further refined, edited and contextualized in Photoshop and possibly Illustrator. Given a Rhino3d file with lines already traced, students will construct a 3d model of a kayak by constructing a jig and using NURBS modeling techniques. VRay is a photorealistic render engine plug-in for a variety of 3d modeling programs, including Rhino. While it is an extremely powerful rendering engine with globla illumination, irradiance maps, and raytracing, it's also a complicated one. There are many different variable settings that can change how your rendering comes out and it will take many rounds of trial and error to get exactly what you want out of the renderer. This may be time-prohibitive, especially when you are just beginning to use VRay. Our goal is to use the software as a set-up of lighting, shadow, and perspective, then take the result into Photoshop or another photo editing program to get finer details. For inspiration of what else you can do with 3d modeling, take a look at The Third & The Seventh . Create, edit, and assign materials to objects. Edit VRay settings and load preset settings. Options shown here include settings for Camera, Output (image), Environment, Displacement, and Indirect or Global Illumination. Create a system based on physically based daylight, or set it to a specific location and time. Creates an infinite plane along the XY plane at the Z zero location, creating a horizon. There are two ways to access the Material Editor in V-Ray: from the toolbar and from the Object Properties panel. Using the V-Ray toolbar, left click on the icon that looks like a tag with the letter "M" on it. Or, select the object(s) to create a V-Ray material for. Use the Properties command and select Material from the drop-down menu. Assign by Plug-in and then click Create. Open the Material Editor in V-Ray. Right click on Scene Materials and select "AddVrayMtl." Materials can be attributed to both layers as well as individual objects by using the Material Editor. Materials can be made up of different layer attributes (such as texture, transparency, bumps, etc) in effort to not read more than a flat texture mapping. Sometimes these layers depend on a value (such as intensity or a percentage of transparency) while other times they come from a gray-scale image. You can quickly view what these materials look like by changing the view to Rendered View which offers a simplified version of the texture maps on the object. However many of the details will change once you actually render the image so it is important to test render throughout the process to check your work. The next step is to attribute the material to objects or layers. Materials can be applied in two ways: from within the V-Ray Material Editor, or within an object's Properties in Rhino. In the V-Ray Material editor, right click on the material name, and then click on either "Apply material to layer(s)" or "Apply material to object(s)". 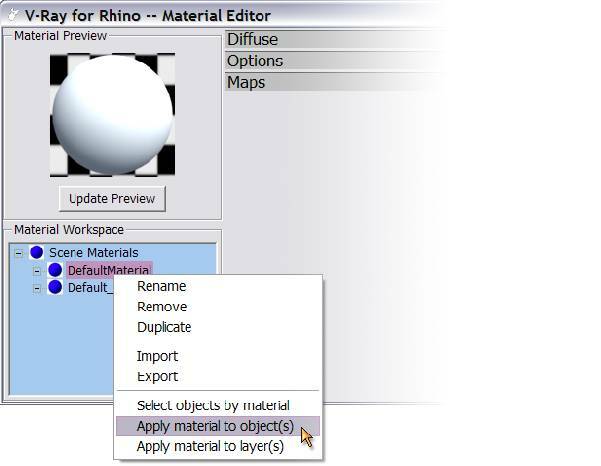 To attribute the material to objects or layers in Rhino, select the objects or layers. Then, use the Properties command and select Material from the drop-down menu. 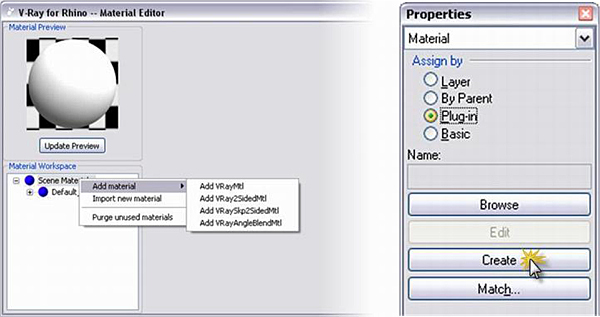 Assign the material by Plug-in, and then click Browse to select the desired material (in the case of this workflow, the material is called Screen1). Change the overall color of an object OR texture map an image onto the an object by selecting the "m" box. Change the overall transparency of an object OR map a transparency pattern onto the object. Black is completely opaque and white is completely transparent. Changes the object to become an emitter. Change the intensity to affect how bright the light source becomes. Can change color, intensity, and transparency. Adds reflection to the object. White is completely reflective (like a mirror) and black is non-reflective. By Default the reflection layer has a fresnel map which varies the amount of reflection based on the viewing angle (notice the capital M next to the Reflection layer). To make more reflective, increase the Fresnel IOR. The darker the Refraction Transparency, the more the material references the edges of the objection (although transparent). Use this rather than Refraction Color to change the color of the transparent material. Fog color is dependent upon the multiplier, the color and the size of the object. Be sure to pick a color that is slightly less saturated that you desire. Helps change the frostiness of the transparent material. The lower the number, the more blurry the refraction. Essentially the degree to which the angle of light entering the material changes upon exiting the material. Calculated the light refracted from the tranparent object. Lowering the IOR decreases the intensity of the Refraction settings. Changes the way the surface texture appears three-dimensionally, changes the surface normal to create the illusion of surface detail. In Rhino, you can save views so that you'll be able to come back to them at any point later on, even if you've shifted your view around in any of the viewports. Right click on each viewport title and you'll see a drop down menu; go to Set View and click on Named Views.... 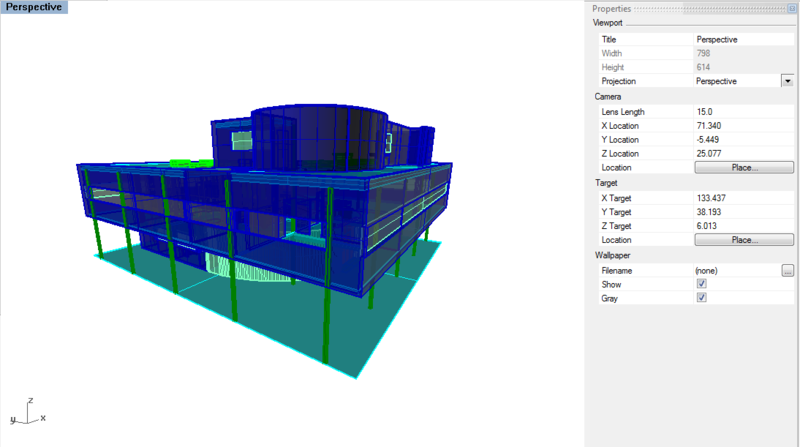 Here you'll be able to save your current view in the currently selected viewport and give it a name. The OrientCameratoSrf command allows you to set up a surface for the camera to lock on. This can be very helpful when setting up exact views, such as axonometrics. Birds Eye - this view if from above, looking down at the overall context of the site and the design. The perspective camera in Rhino is set to 50 mm by default, replicated the approximate amount of perspective we see in real life. Look at this value in the Properties menu. As the value increases, the lines of perspective become more parallel. As the value decreases, the lines of perspective increase which could be helpful for an interior view. See examples below. Lighting plays the most important role in rendering because it affects the color, shadow, reflection, and refraction among objects and materials in the scene. V-Ray comes equipped with Global Illumination , which is the natural lighting in a scene. It can be difficult to produce a specific lighting effect because of the many ways to create lights, as well as to change a light's appearance in a final render. Be sure to choose a light that's best for the type of lighting needed for the scene. Lights can be created using Rhino commands. Or, use the sun and sky tool that is built into V-Ray to position a directional light. There are two main ways to change lighting options. 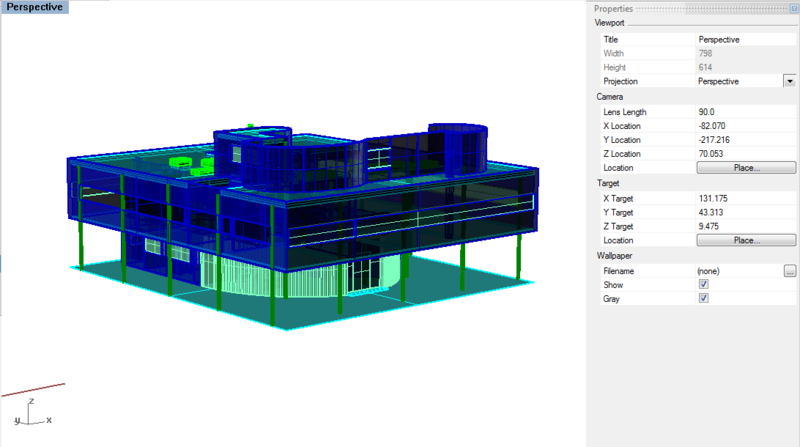 The first way uses the Properties panel in Rhino to change the properties of a selected light. This is helpful for controlling specific light objects. The second way uses Light Options in V-Ray, which controls the ambient light in the scene--that is, the lighting for the entire scene, not just one specific light. Settings for all lights are controlled in V-Ray Options. This controls the Global Illumination . A V-Ray Sky can be added for illumination. This controls the color of the background in the render. It can be changed to an image by clicking on the m next to the color selection. Typically, exterior renderings can quickly be made by using the default GI. However, to light a scene specific to a time and day, the sun and sky can be set. Interior renderings require a different set of lights. There are several different types of lights in Rhino , but only a few are especially helpful for rendering interior scenes . This is a quick overview of the different lights Rhino offers, but for a more in depth look at lights look at Types of Lights in Rhino , and learn how to better light interior scenes . No matter your level of comfort with lighting in Rhino, it's always a good idea to test render your scenes or render portions of scenes before finalizing your lighting setup. For directional light, the direction of the arrow is the direction from which the light will shine. While spotlight intensity and range can be edited, directional light is different because it emits uniform parallel rays in a specified direction, simulating sunlight. The exact location of the light object does not matter as the light object only indicates the direction of the light. A linear light object emits light similar to a fluorescent tube light. A rectangular light object emits light in one direction. Unlike the Spotlight, with Rectangular Light the angle of the light cannot be changed. The size of the light object affects its lighting range. If a larger range with the same light intensity is needed, then the intensity of the light will need to increase. A larger rectangular light will spread the light out over a larger area, so the shadows will become more diffuse. A point light emits light from a single location in all directions, also known as omni light. It is useful for interior scenes that require artificial lighting (such as from a light bulb). Especially important when working with point lights is paying attention to the light's intensity and decay settings. The spotlight will appear in the model as a cone shape. The direction of the cone will be the direction of the spotlight. Spotlights with a narrower cone will produce a more concentrated light than spotlights with wider cones. The width of the spotlight does not determine the range of light (how far the light will reach), but the length and width together control the shape of what is illuminated by the spotlight. The purpose of renders and perspective drawings is to make help the viewer understand the spatial qualities of the design. Sometimes texture mapping using a rendering program can be really helpful in showing the realistic qualities of light and materality within a digital model - but there is also a potential for the texture mapping to flatten the space. Texture mapping every detail within the digital model can also become a quick time trap, both in the effort you contribute to create the materials, and the amount of time it takes for VRay to render. Another way of texture mapping is in post processing : Photoshop. Trees and people are a great example of something that we typically do not 3d model but add later on in the image. Other examples may be other elements of context (signage, neighboring buildings) as well as complex materials (water, grass). VRay is a powerful tool for rendering realistic scenes from a 3D model. Generally, a model is built, a point of view is chosen, the scene is rendered, and the resulting image is edited. This workflow will show the basics of rendering in VRay, including render settings, material selection, and texture mapping. Using the facade of the de Young Museum as an example, this workflow demonstrates how to use custom-generated image maps to define composite material "layers" in V-Ray. Using the material editor dialog, we will edit the transparency, diffuse, and displacement layers to create the pattern of punches across the material, alter the color using an image map, and simulate the bumps of the material. This workflow shows how to use Vray for Rhino to create various rendering outputs, using the Sunlight System and the numerous options with the Render Options Dialogue box and the Light Properties Dialogue box. This workflow shows a simple method for rendering 3d models to show cut sections or plans while maintaining true lighting. We will utilize specific tools in Rhino to split our model, than create transparent materials in VRay to "hide" our cut-away model while leaving its ability to block light. A great collection of texture map ensembles. Each material consists of different matching material maps (such as diffuse, bump, displacement, transparency). This is a good place to go if you want to create your own material from scratch. VRay for Rhino Materials] : This website has some good materials for free download, such as concrete, wood and glass. Be sure to save the whole unzipped folder in an easy to find location. Retrieved from " http://studiomaven.org/index.php?title=Course:200c_f13_steinfeld_session_248480 "